A Monroe County teacher was arrested on a theft charge Tuesday after detectives say security camera footage from a condominium shows her stealing a resident's beauty supplies that were just delivered to the complex's mail room. Christi Gardner, 41, was arrested on a petty theft warrant signed by Monroe County Judge Sharon Hamilton on Tuesday. She was released later in the day on a bond of $2,500. Gardner could not be reached for comment. According to Sheriff's Office Deputy Nicholas Thaler's arrest report, security camera footage at Summer Seas Condominiums at mile marker 88.5 on Plantation Key shows a woman police say is Gardner walk into the mail room toward packages that were delivered just moments earlier at 4:30 p.m. March 29. Footage shows her examine the labeling on the packages before one, a box containing ULTA beauty supplies, grabs her attention. She steps away from the box when a condo resident comes in to check his mail. When the man left, Gardner returned to the mail room, grabbed the ULTA box and quickly left, Thaler wrote in his report. According to the arrest affidavit, Gardner lives at an apartment complex at mile marker 79.9, not at Summer Seas. The buyer of the ULTA products said she paid $110 for the order and had just received a confirmation that the package had been delivered one minute before Gardner was filmed leaving the building with the merchandise. According to Thaler's report, Gardner admitted to a Monroe Sheriff's Office detective on May 3 that she took the package and that she was sorry she did. The Monroe School District released as statement late Wednesday afternoon acknowledging Gardner is a teacher at Stanley Switlik Elementary School. 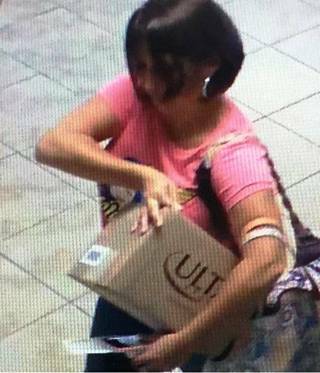 A woman is filmed on a security camera taking a package of beauty supplies from the mail room of the Summer Seas Condominium on Plantation Key on March 29, 2018. "The District was recently made aware of the involvement of one of our employees in an incident which resulted in their arrest by local law enforcement," spokeswoman Lynsey Saunders, communications and community relations coordinator wrote in an email. "Criminal charges are pending and the District is looking into the matter to determine the most appropriate response." According to Gardner's Linkedin account, she has taught at Switlik since August. She was a teacher for 14 years in Brevard County before coming to the Keys, according to the Linkedin account, which also lists her as a Mary Kay cosmetics "beauty consultant.